Schedule an hour totally dedicated to you. Visit us in our beautiful location or we can visit you in the privacy and comfort of your home. This is an excellent choice for many people! 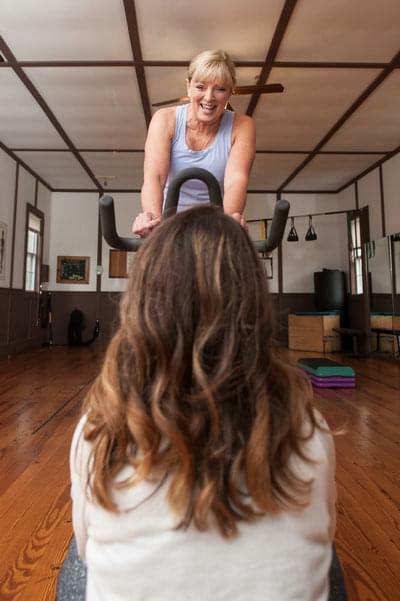 Whether you are currently active or have never participated in a fitness program, our trainers are here to inspire, educate and hold you accountable! Perhaps you have a demanding schedule, or you are dealing with an injury and/or recovering form a surgery. Our trainers can accommodate your every need so you get the most out of each and every session. Do you suffer from a neurological disorder or some health issue that challenges your quality of life? If you answered yes to any of those statements, Studio e can help. You will receive a personal training session tailored to fit your health and wellness goals and needs. We also offer at home sessions! We will be happy to come to your home or boat house and give you a personal session. We are more than happy to do what ever works best for you and your lifestyle! We have trainers available to meet with you between the hours of 5:30 am - 7:00 pm (Monday - Sunday) in our Tiger or Lakemont location - so no excuses! You will experience a well rounded workout that will challenge you, leave you feeling empowered and will improve your quality of life! As always, there are no memberships fee and payments are by session not per month. Experience what Studio e has to offer in our two locations or at your own home!